With one look at Air Raid's band photo (see below), I had a serious case of early 1980's deja vu. Yeah, back in the day, I dressed like that. Cut off denim jacket, patches, and everything. Thank God I don't have any pictures of those days. I probably didn't have any at all as I was probably to stoned to use a camera. Air Raid: what decade are we in? Yup. 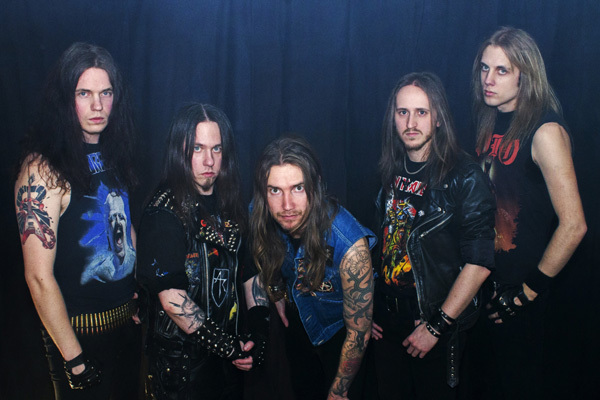 Sweden's Air Raid plays classic 'keep it true' heavy metal. Actually, the band played the same famous festival in Germany in 2013. Honestly, these youngsters are better than expected at their chosen genre. They mix up twin guitars with crisp riffs and bristling leads with an often firm and galloping pace supplied from the rhythm section. Vocalist Arthur W Andersson goes for the classic metal voice, but ends up with an unmanageable screamo sound at times. In the end, I found that I liked their musical approach more than the vocals, but that's just me. I was mostly surprised by the proper mixture of speed, riffs, and melody throughout this short album. Victim of the Night, Vengeance, and The Fire Within congeal these elements in a strong presentation. But, in light of my previous comments on the vocals, the most impressive song is the instrumental Flying Fortress, which captures Air Raid's command of the traditional metal sound. 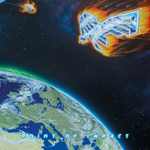 Of final note, because of Point Of Impact being released on vinyl first, the album is brief containing only eight songs at just about 35 minutes. Otherwise, the album is a promising start for the band, and something diehard true metal fans will enjoy. Air Raid's Point Of Impact is a promising start for the band, and something diehard true metal fans will probably enjoy.